Met Helen at 18th & Castro and we went down town. She had some errands to do, and I trailed around in her wake. Then went to the Owl, to show them my rubber gloves. After much time and argument they offered me another pair at half price. I said I wouldn't do it, so they gave me another pair. Then I left Helen and rushed to Hale's, where Kate was waiting for me. She had a turban she had made for me--with much pains and I wore that. We lunched at the Tivoli Café, then went to the Penn. Ins. where she arranged to have the policy made over to me--after her. What is interesting about this quote? How might we visualize it? What type of data could we gather from it? In what ways is this data incomplete // what would we need to supplement it? How might we approach tackling a project using this source? 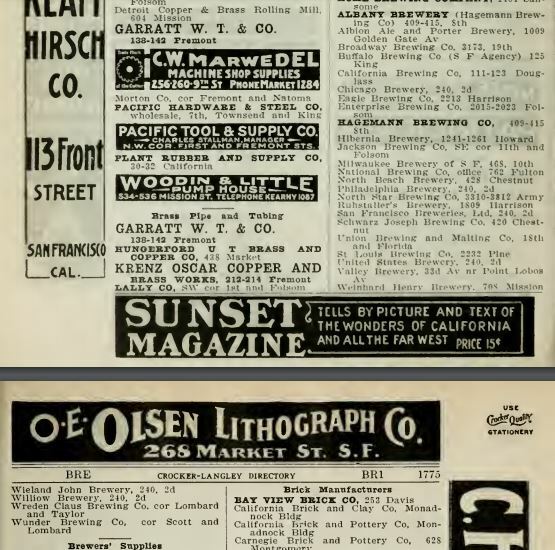 p. 1723: Classifieds section begins. Note that some other phonebooks (like Polk's) list a block-by-block listing of homes and businesses also. Let's begin to gather some data. I'm curious how the distribution of breweries and brewer suppliers changes before and after the 1906 Earthquake. Following patterns of industrial migration and using the aftermath of the earthquake to rebuild downtown, I posit that the distribution of these spaces will scatter further to the outskirts of SF after the earthquake. Go to page 1769 in the pdf. Let's start to clean up this data. We want to turn this into a csv (comma-separated values) file (a type of file that stores tabular data as plain text), so we will need to separate the values with commas. Insert a comma between the name of the business and the address, and remove any extra spaces. (e.g. in the first line, place a comma between (INC) and 210S and remove the space). 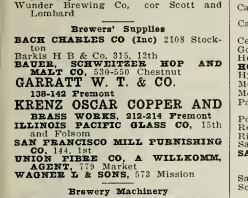 Save your file as a 1907brewerysuppliers.csv. The .csv addition is important in denoting this as a comma-separated value file. It's often useful to manipulate this data in a spreadsheet. You have two options for how you can get this data there. One option is to open the csv file in a spreadsheet (the default way that computers open csv files), or to copy and paste from your text editor into a spreadsheet. In excel, then you can highlight the column with your data, click on the data tab and then click Text to Columns. Either way you should now have your data organized in rows and columns. 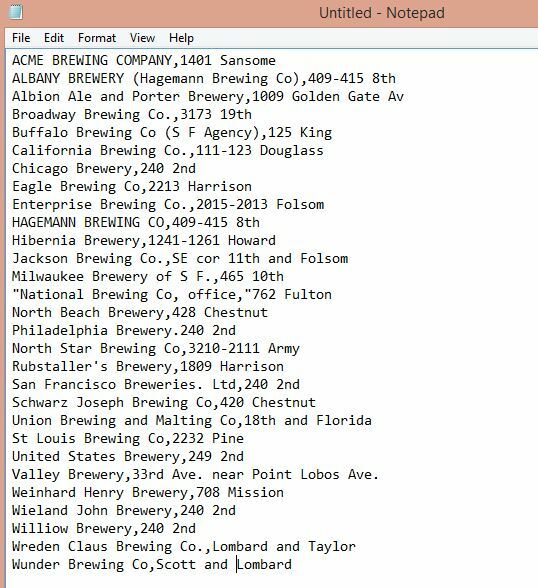 Insert a row at the top to insert header categories for Brewer's Supplier / Address / City / Lat / Lon / Formal Address (only Supplier and Address is filled now). Next, we'll fill the City column. In the top box under the City label (C2), type San Francisco. Click C2 and drag down to C10 (this should fill all your used lines) and click CTRL+D (or Command+D), to fill down. Now all the boxes say San Francisco to help us geocode them. Next, we'll geocode this data. Go to GPS Visualizer Geocoder. Once you have your code, copy and paste it into the API code area on GPS Visualizer. 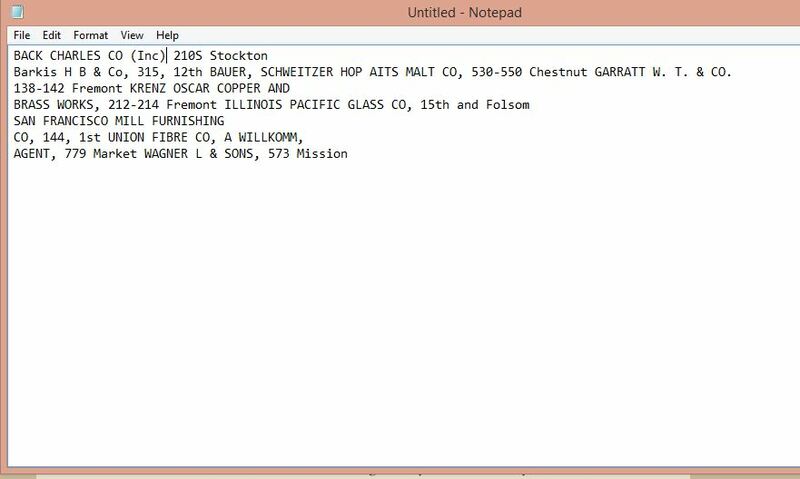 Go back to your spreadsheet and select the text areas (either [A1:C10] or [A2:C10]) to copy/paste to the input box on GPSVisualizer. Type of Data: Select "raw list" if you did not include headers [A2:C10] or "Tabular" if you did include headers [A1:C10]. It will alert you/error out if you choose the wrong one. 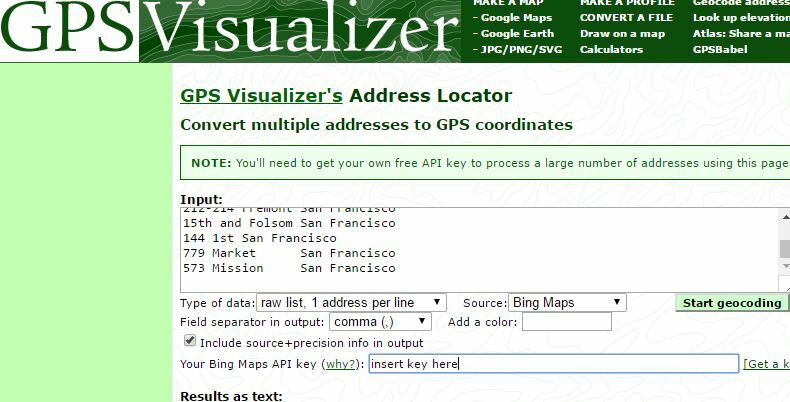 Source: Either Bing or Mapquest, whichever corresponds to your API code. Insert API key in the box. Click "Start Geocoding" (note if you make an error, click "cancel geocoding" if you'd like to end the process and "clear results box" to start fresh below). Now you can put your data back into your excel file. Copy the entire results box and paste back into your excel doc to the right of your data (Hints: If you used tabular data with headings, it will paste into your excel file into columns neatly. You'll also paste into the header row....If you used raw data, you'll paste into the first open box on the right (D2). Then you'll need to go to "Data" and click "Text to Columns"). Think of something you'd like to explore more (something for which you could gather data from these phonebooks). You could map the spread of items between two categories in this 1907 phonebook; you could compare a category between two different years (e.g. 1904 and 1907) to explore the earthquake's effect; or you could take a different tack entirely. We will use these to map in class in a few weeks, and we will spend classtime today, and Wednesday to start gathering this data. You should aim to have approximately 50-100 lines of data to map. Take advantage of the time in class (or in office hours) to ask questions or seek help. You could work on this with a partner, but the quantity of data expected would double.